From first sight to final inspection a thorough utility pole inventory and inspection is a vital part of successful field asset management. 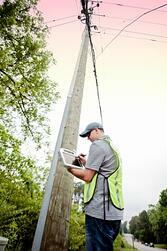 But what actually happens during a utility pole inspection? Today we will discuss the first crucial step: Audit from Afar. In previous posts we have explored the eight steps to accounting for, capturing data on, and closely inspecting the condition of utility poles and other assets in the field, but each of these warrant further explanation and exploration. Why is this so important? Well, when it comes to field asset management, an ounce of prevention is certainly worth a pound of cure. In-person asset inspection identifies potential and existing problems before they become actual hazards that may lead to fines. Proactive inspections will save companies time and money. More importantly, they can also save lives: simple audits have the potential to make working on or near a pole safer, so everyone benefits. The first thing a technician does when conducting a utility pole inspection is take a good look at the pole from a short distance away. One Alden technician tells us that his “intention is to arrive at the pole having already identified a majority of the violations and potential violations that will require a little deeper investigation,” not waiting until arrival directly under the pole removes the pitfall of not being able to see the forest for the trees, as it were. “I can see a majority, if not all, of the attachments and can follow the wires leaving the poles to all of their destinations,” he adds. He then tucks these in his memory for further inspection upon arrival at the asset’s location. Once done (and through all the steps in the process) the technician provides pole owners with a detailed synopsis of each structure and its attachments, allowing the asset to be easily located using joint use management software. Field technicians also bring to the owner’s attention things about the pole that are not in compliance with their state or the NESC’s governing body’s rules and regulations, so that the owner can take action to conform—all without anyone except the technician needing to physically visit the site. B, of course, for Behold your Pole Up Close. After collecting information and spotting issues that are readily visible from afar, technicians will approach the utility pole for a closer look and gather details of violations, conditions, and other information that can only be observed up close and personal.